Select Length: 1 ft. or 150 ft.
12 volt DC LED rope lights 3/8 inch flexible under-cabinet 12VDC marine boat rope lighting. Discreet, even colored light spread with Warm White, Cool White, Green, Blue, or Red LEDs for any 12 volt marine LED application. Sold by the foot or in 150 foot spools. 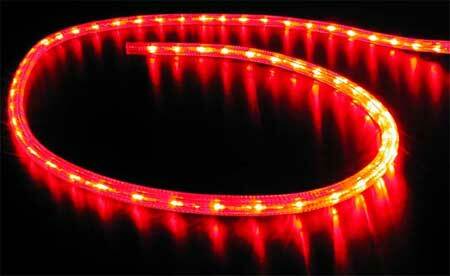 LED Rope Lights function as a more durable and energy efficient alternative to Incandescent Rope Lights. LED Rope Lighting Contains no filament so it can be twisted and spiraled without risk of breakage. For terminating your rope light's run, use an End Cap. To complete your Rope Lighting setup, use the 12/24 Volt DC Power Cord B Connector. Only for use with a 12 Volt DC power feed (if you can solder, for the most compact connection you can use the Invisible/Easy Splice Connector - reference Wiring Directly to Rope Light using an Easy Splice Connector). For household 120VAC use check out Power Converters to step-down and rectify your voltage to 12 Volts DC. 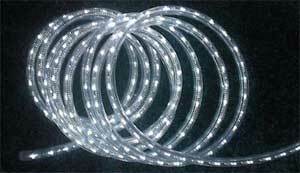 Or head over to the 120VAC rope light page and order a length of household-specific lighting! For use with an AC Power Source, use the 12 Volt AC Power Cord "D" Connector to rectify the 12VAC current to 12 VDC. If you're interested in a dimmable rope light, use the Intervolt Switchmode 12V Dimmer Module (switch not included) or the Frilight Elwood 12 Volt Rotary Dimmer. All available 12 Volt DC colored rope lights can be cut every 3 inches - EXCEPT RED, which can only be cut every 4 inches. This Rope Light is priced and sold by the foot or in 150 foot spools. Warm White: 0.87 watts, 0.07 Amps/foot, vertical bulbs, cuttable every 3 in. Cool White: 0.87 watts, 0.07 Amps/foot, vertical bulbs, cuttable every 3 in. Green: horizontal bulbs, cuttable every 6"
Blue: 0.87 watts, 0.04 Amps/foot, horizontal bulbs, cuttable every 3 in. Red 0.65 watts, 0.04 Amps/foot, horizontal bulbs, cuttable every 4 in. Installation Note: Before you install your LED rope lights, connect the power and verify illumination. Then as you do your installation, beware of which end you need to feed the power to. Why? 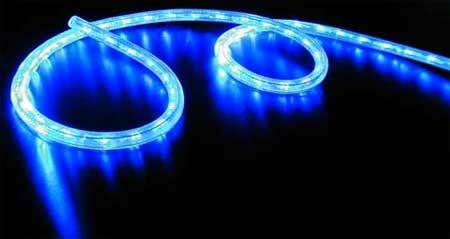 LED rope lighting contains diodes that allow the electricity to flow in one direction only. Because of this, when you hook up power to the LED rope lighting, it may not illuminate. If this is the case, disconnect the power and reconnect it to the other end of the LED rope lighting.